In the writing of my “Marginal Eyes” manuscript I had to ride my Thesaurus pretty hard, finding a variety of synonyms for “margin.” Nuance was called for. The “margin” I was writing about in this paragraph: was it a “fringe,” a “periphery,” a “boundary,” a “rim,” a “horizon”? And would those words accurately describe the reality of a painful social phenomenon? But this month I took several days away from work and phone and computer; I drove to the Pacific Coast expecting to see one of its blustery wild winter storms from the warm side of a plate glass window in a cottage on the bluff. By now I should know better than to have expectations, so I just laughed when Mother Nature gave me three days of glorious sun, cloudless blue sky, and tiny ocean rollers that would have looked at home on my native Lake Michigan on a calm day. Yet I also saw for the first time how “coastline” might sometimes be used as a synonym for our cultural “margins.” If the Pacific were a metaphor for our culture, the driftwood tossed so easily onto the shore would be the equivalent of marginalized people. 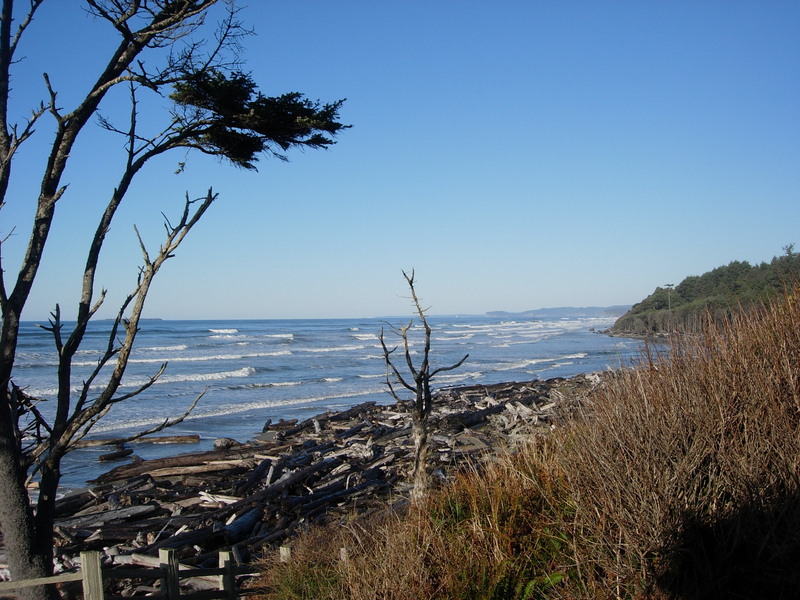 And Kalaloch Creek, flowing beside my cottage could represent the social resolve to reduce the suffering of the marginalized. But the fresh water gently winding its way to the shore has comparatively little influence on the tumbling saltwater or what the waves are determined to leave on the shore. Sometimes the dynamic sea might reclaim a log or two, only to drop them back at land’s edge a few yards or a few miles further along. But mostly the logs stay right where they are abandoned by the sea. I saw how little can be done to change the coastline and its detritus. So I did what I do whenever I go to the margins – I walked the edge and paid attention. I sat with the logs; I noticed their particular beauty, felt their strength, and appreciated my being able to be with them. I encountered the abandoned logs intently in the margin where the land meets the sea.